As a terrible person, I thrive on opportunities to lie to my friends and back-stab my loved ones. A large portion of my favourite games feature hidden roles and betrayal mechanisms and Bang! The Dice Game falls squarely in this camp. What better theme to house this much deception and mistrust than the Cartoon Wild West? Well, I can think of a couple but come on, cowboys are cool! This is an undisputed fact. Cowboys, astronauts and dinosaurs, but since no one is rushing to send me a brand new copy of High Noon Space Stegosaurus, let us talk about Bang. Bang! 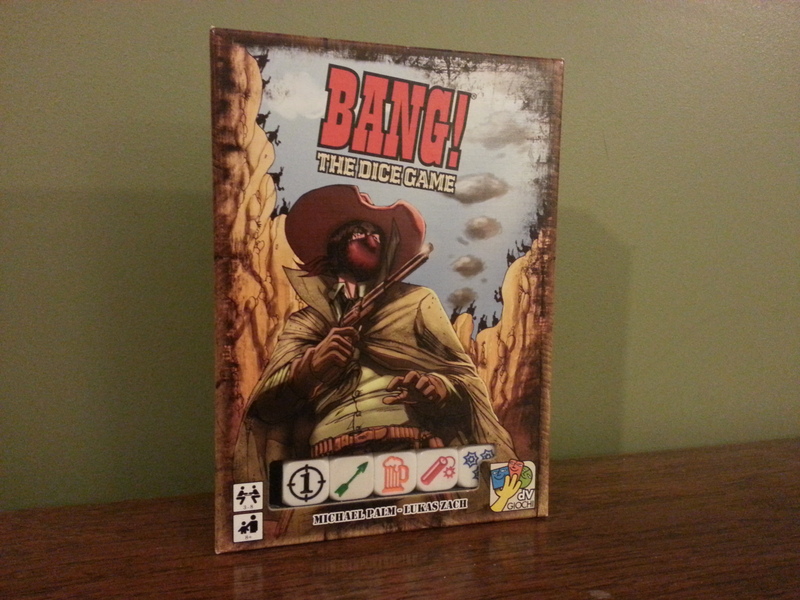 The Dice Game is, as it’s name would suggest, a re-imagining of the much loved card game, Bang! 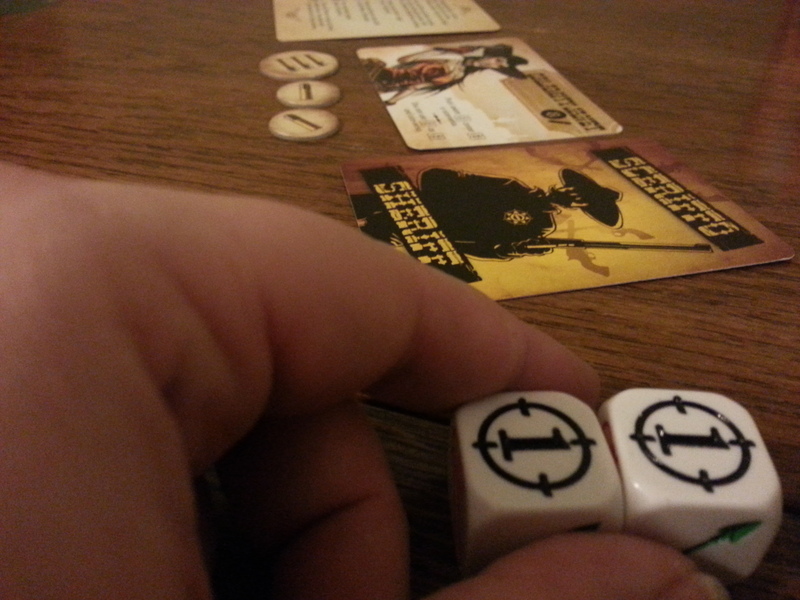 It’s a bluffing and player elimination game for groups of 3-8 players, set in the old American West. You’re going to be deceiving your opponents and making sure you end up the last gunslinger on their feet. Forget friendship, forget family, forget marital bonds. In Bang! The Dice Game, the only player you can trust is yourself (unless you forget which role you have and accidentally sabotage yourself). Like many social games, Bang! 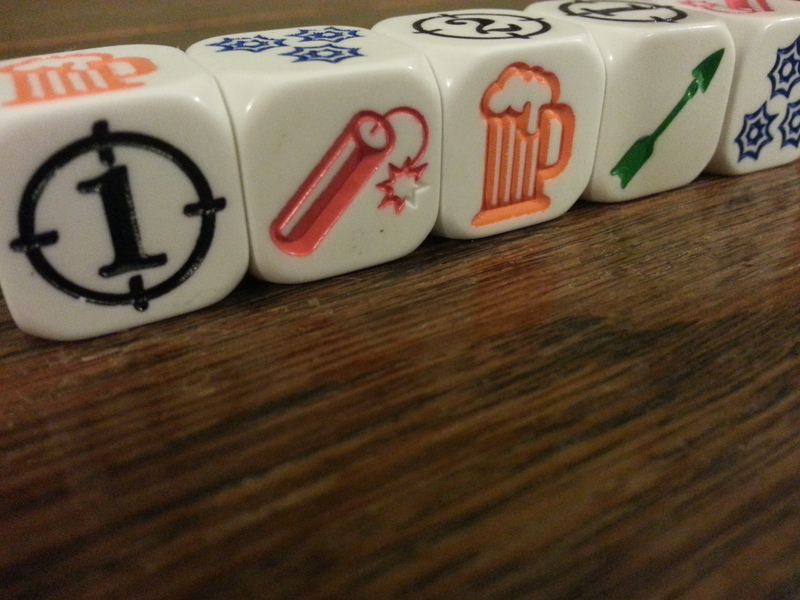 The Dice Game doesn’t have a lot of set up. Each player is given a character at random, which tells you your maximum health along with your character’s special power. This goes face up in front of you and is open information. 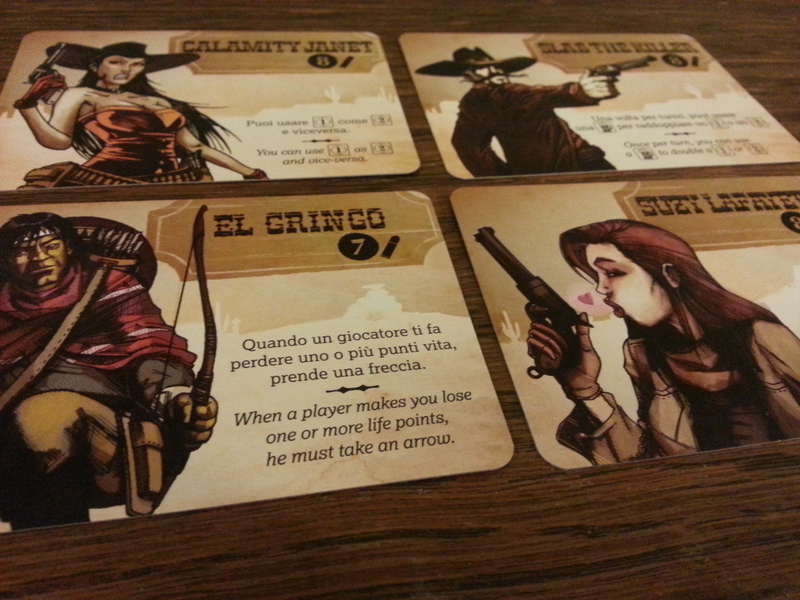 Each player is also given a role card, which tells them whether they are a Sheriff, Deputy, Outlaw or Renegade. The Sheriff immediately introduces themselves, while the rest of the players keep their roles hidden. 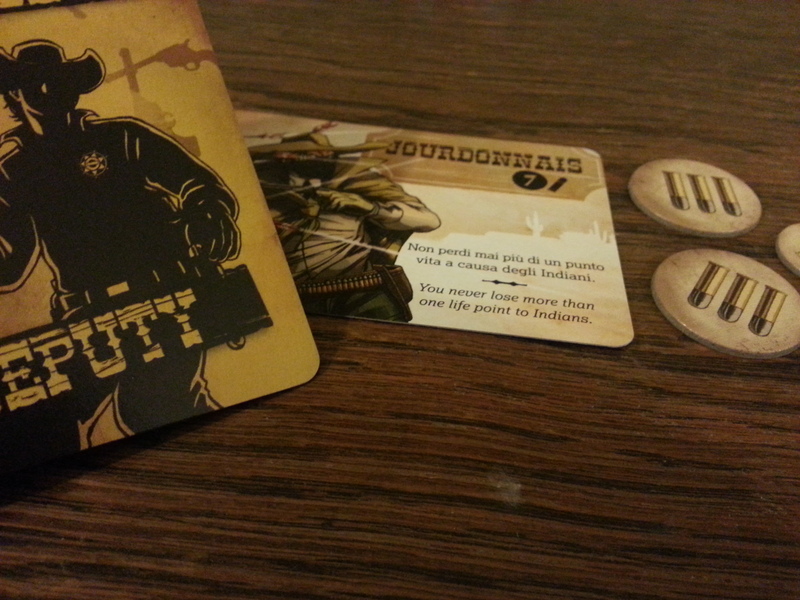 Each player takes a number of bullet counters, equal to their max health (with a tasty plus 2 for Sheriffs). Place the leftover bullets, along with the arrow tokens in the center of the board. Setup complete! I really AM the Deputy! The start player begins the game by rolling the five dice. In good old fashioned yahtzee style, if you don’t like what you’ve got, you can reroll up to twice before settling on your decision. 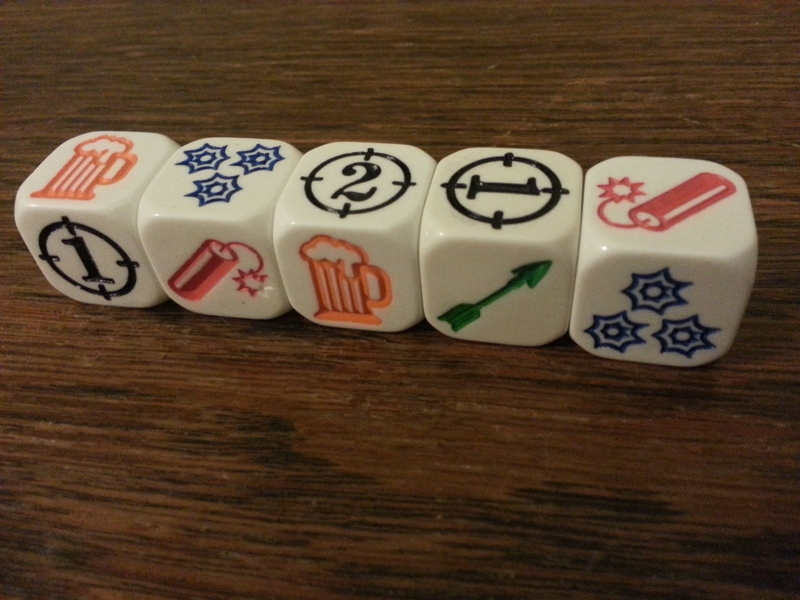 Dice results are as follows: Bullseyes (numbers 1 and 2), arrows, dynamite, beer, gatling. So let’s talk about that you can do with these. 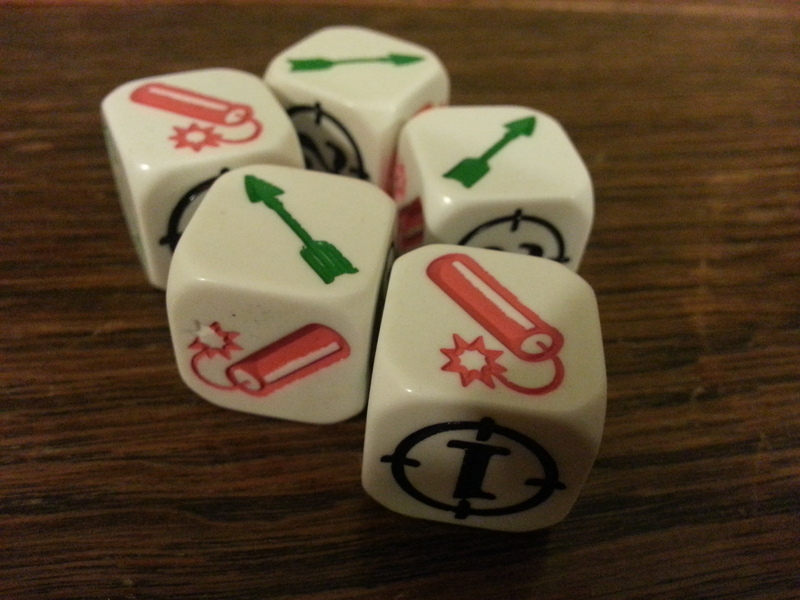 Attacking your opponents: There are generally two ways of harming another player with your dice roll. Bullseye results let you make single gunshots at your opponents either one (as indicated by the number ‘1’ on the dice) or two (you guessed it) places away from them at the table. Spend one die to do one point of damage, making the player cough up one of their valuable life bullets. You can also damage all of your foes in one fell swoop by rolling three or more gatling gun symbols. This does one damage to all but the active player. You also get the added bonus of discarding all of your accrued arrows without taking damage. Boom, gattle! Healing: Beer make feel good. For every beer result you lock in, either you or another player of your choice receives one shiny new health bullet thingy back, up to the player’s max health. Negative effects: It’s not all fun and games here in the West. Dice rolling has a heavy push your luck element and every time you roll, you risk returning a negative affect. Whenever a player rolls a green arrow symbol, they must immediately take an arrow from the center of the table, even if they choose to reroll the dice. At the moment the last arrow token is claimed, each player takes damage equal to the number of arrow tokens they have amassed. Dynamite icons are also bad news. Not only can dynamite not be rerolled, but when you get three of them your turn ends (though you still get to resolve your dice results) and you lose one health point. Don’t forget about the character cards. They have specific powers which can allow you to hand out additional arrows, fire greater distances and a whole host of other things. “So how do I win? !” Alright, settle down. Each different role has a win condition attached. It’s possible for eliminated players to win, even from beneath an arrow-pocked grave. The Sheriff is successful if all Outlaws and Renegades are eliminated. Deputies win if the Sheriff survives and Outlaws win if the Sheriff dies, while the Renegades are victorious if they’re the only player left. Trust me, it’s not nearly as hard to remember as it sounds. As soon as someone’s win conditions are met, the game ends immediately. I want to get this out there straight away, I think this game is great. As a light bluffing and hidden role game, it ranks very highly for me. We’ve already established the undisputed coolness of cowboys and my love for deceit and trickery. The theme makes sense with the gameplay and overall it makes the game very accessible which means, coupled with the relatively short play time, it is a lot easier to get to the table. It’s full of comically named versions of characters people will recognise from popular culture which helps people ease into the theme and the fun. PEW PEW, TAKE THAT SHERIFF! For me a good hidden role game has certain key elements that blend well together. Firstly there needs to be an active bluff, wherein players are encouraged to openly lie to others about their true identity. The hidden role has to mean something and revealing your secret should have consequences on the game. I also prefer hidden role games to have limited amounts of information that player need to remember, here there’s very little to remember. There are just four roles with clearly defined objectives, making it easy for players to recall and use that information in order to bluff and connive their way to victory. Once you’ve played the game a few times with the same group, the roles are second nature and you don’t have to worry about floundering and being caught out. This is part of what makes it such a great bluffing and social deduction game to play with people who don’t normally thrive in overly social situations. There is of course, the dreaded player elimination, but in a game that takes no more than 15 minutes to play this is not a serious issue and more an opportunity for a quick toilet break while the others finish shooting each other. The dice chucking part of the game is great, so long as you don’t mind a fair dollop of luck with your games. The strategy in this game isn’t really in what you roll, but how you sell it to the other players, doing your best to convince them that it is in their best interests to be shot by you. I rather like the yahtzee mechanic employed here as well, it tends to keep the pace up and the added randomness helps the game feel lighthearted enough that no one can take it too seriously. There’s a certain satisfaction that comes from the bullsey shots, which are always accompanied by super cool pistol gestures. It’s hard to take the direct conflict too personally because that’s the whole point of the game. What the dice look like really close to your eyes. The dice themselves are really nice, we’ve all been fairly spoiled with custom dice in games over the last few years but these still stand out. The dice are chunky and substantial feeling, with large brightly coloured symbols that are easy to see from any distance. The cardboard tokens are nice and thick and the cards are of a decent quality. The box itself is a winner in my eyes, It’s portable robust and has a cool little perspex window on the front through which you can see your imprisoned dice, lovingly arranged to show whatever combination of symbols you like. The graphics and text are clear and functional and although the rulebook is of the dreaded fold-out variety, it is well laid out and makes the game easy to pick up. I’m not hugely keen on the art choices made, but that’s a very subjective thing. I could probably do without the seemingly obligatory emphasized breasts, which stand out like… you know. Probably the least consistent part of the game, and the thing that lets it down is the characters. Some feel unbalanced, like their special ability doesn’t make up for their low max health compared to other players. We haven’t had any major issues with this but people have started learning which special powers are more useful than others. I’ve certainly had games in the past where I haven’t used my character’s special ability the entire game because opportunity simply did not present itself. Overall I don’t have a lot of criticism for the game, It knows its role and it plays it well. From experience it goes down consistently well with players of mixed abilities and ages. I don’t know if I would play this with kids as young as 8 as shown on the box, but certainly with older kids and upwards. It also works brilliantly as a palate cleanser in between longer games, playing at around 15 minutes on average. I’d recommend this as a solid buy for any game collection. It’s a great gaming experience and has a heap of replayability for its low price bracket. Bang! The Dice Game has cemented its position in my regular circulation and I don’t see it leaving any time soon.